If you are looking for more versatility and the ability to draw or cut your own designs, consider buying a digital die cutting machine. Many of these hook up to a computer, where designs can be custom made using software. Use this die cutting machine comparison guide to compare the best die cut machines. The Silhouette Portrait is possibly the best portable die cut machine on the market. It's portable, weighing only 3.5lbs, but cuts and draws as equally well as the Silhouette Cameo with 210 grams of force. The machine uses a 8" x 12" cutting mat and can cut up to 10 feet in length. It includes Silhouette Studio design software, allowing users to create their own designs from scratch. The Silhouette Portrait 2 is very similar to the Silhouette Portrait 1. Some added features include the Autoblade for automatically adjusting blade adjustment and a deepcut blade for cutting materials up to 2mm thick. The Ciruct Explore is a very popular machine that can cut and draw 0.25” to 23.5” wide. It has dual carriage heads so you can cut and draw in one pass. It's one of the easier machines to use, and it's more powerful and precise than the Silhouette Cameo. The Smart Dial automatically adjusts blade speed and pressure based on the selected material. It uses the online Cricut Design Space, so an internet connection is always required to cut. It does support Cartridges, but they must be connected to your online account. The Cricut Mini is a portable die cut machine that can cut and draw up to 11.5". It weighs 5.5lbs, making it easy to move and store. It requires an internet connection and uses the Cricut Craft Room Software. The Silhouette Cameo 2 is another popular model. It can cut up to 12 inches wide and 10 feet long (for lined media only) with 210 grams of force. It's weaker compared to most machines, but comes with some nice features. The Pix Scan technology allows you to take digital photographs, upload them, and make cut lines. It connects to a computer, where users can create detailed designs from scratch. If needed, users can cut saved designs from a USB Flashdrive without a computer. The Silhouette Cameo 3 is similar to the Cameo 2. The Cameo 3 has all the features of the previous model and more. Some of these improvements include dual carriages, Bluetooth technology, additional storage, and the Autoblade. The Autoblade is a blade that automatically adjusts itself to the material being cut. The Silhouette Curio is the "swiss army knife" companion tool to the Silhouette Cameo. It can not only cut and draw, but emboss, etch, score, and stipple. It can deep cut, but cutting is limited to 8.5" by 12". It also has 210 grams of force and using the Silhouette Software where users can create custom designs. The Sizzix Eclipse cuts and draws with 600 grams of force and can cut up to 12" x 24". It does not use cartridges, and designs are created using the eCAL lite electronic cutting software. It's a robust and precise machine, being able to cut to the nearest 1/100 of an inch. The Pazzles Inspiration Vue is less popular than the Silhouette Cameo and Cricut Explore, but it does come with some advantages that makes it worth a look. Most notable, the Pazzles Vue has 1000 grams of cutting force, making it one of the strongest die cut machines. Another mention is the wide variety of tools available for the machine, allowing you to draw, engrave, pierce, emboss, and distress. You can even cut edible materials such as fondant, gumpaste, and cookie dough for custom designed pastries using the Pazzles Pastry Tools. The Brother ScanNCut is the first die cut machine with a built-in scanner. Users can scan in hand drawn designs, magazine cutouts, and pictures, and turn them into cutting designs. It does require a computer, and comes with built-in memory. It's full color touch screen allows users to manipulate designs before cutting. 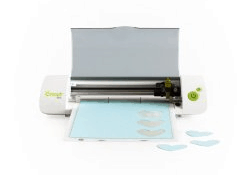 The Cricut Maker die cut machine is one of the more specialized machines on the market. In addition to having dual carriage heads, it has the Adaptive Tool System. 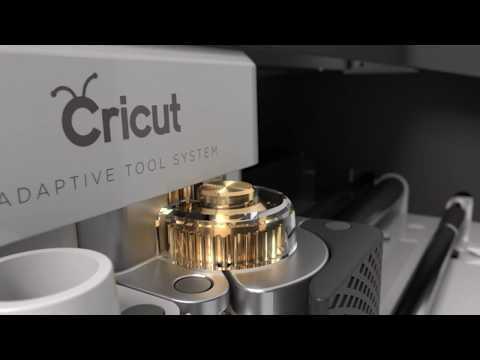 The Adaptive Tool System automatically adjusts the cutting pressure and rotates the cutting blade for precise cuts. The rotary and knife blade make sewing easier, and you can cut through leather with 10x more force compared to the previous Cricut Explore machines. The KNK Force lives up to its name. It's the strongest machine we have come across, being able to cut using 8.8lbs of force - that's nearly 4000 grams! The KNK Force die cut machien has many features that other die cutters don't have, such as a true x axis, a camera for alignment, and a rotary attachment. The KNK Maxx Air is a machine that delivers over 1500 grams of force with wide pressure and speed ranges allowing you to get that perfect cut. With a mechanical precision of .0001″ and unlimited cutting length with a 24" cutting width, you will be able to cut large and detailed designs. 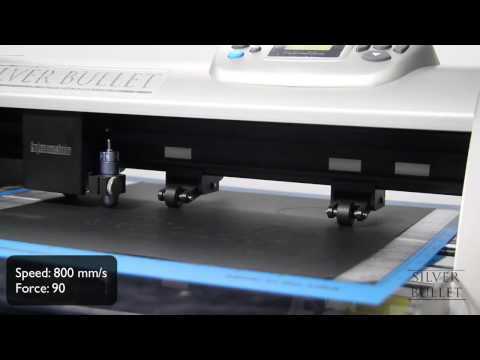 The Silver Bullet is one of the strongest and fastest die cutting machines. It can cut up to 1250 grams of force, and can also draw, emboss, and engrave. The machine is designed to operate at full speed with great precision to get "laser like cutting" . It's can make very detailed cuts and some models can cut up to 24". Haven’t they quit making the Cricut Explore? Now on Cricut’s website, it is Explore One or the Expore Air only. Hi Saundra, that does appear to be the case, but you can still purchase the original explore machine elsewhere. All of the Cricut Explore models use the same Design Space program and cut do all the same things. It’s just a different process depending on the Explore model. The Explore One requires a pen adapter and you pause the Explore to switch from the pen to the blade. You also need a bluetooth adapter if you want that option. The Explore has the dual carriage so you can put both the pen and blade in before you start your cut. It also needs the bluetooth adapter for that option. The Explore Air has the dual carriage and built-in bluetooth. Hello, I am interested in purchasing a machine for making greeting cards, and it will have a second use on random minor home decor projects. I was originally considering the silhouette Cameo and later have decided to possibly purchase the Pazzles Inspiration Vue, but the more research, the more confused I get. I would like something that can handle intricate cuts and has free design capabilities. Any recommendations? Hi Alicia! Both the Cameo and Pazzles Inspiration will cut greeting cards and vinyl for home decor. We don’t know too much about the Pazzles inspiration, but according to their website, it has 1000 grams of force, compared to 210 grams with the Cameo. This means you will be able to cut more kinda of material with the Pazzles. As far as creating custom designs, the Cameo allows for that, but we don’t think you can do that with the Pazzles. Both the Cameo and Pazzles software requires an paid upgrade to import SVG files. The Silhouette is a lot more popular, so you should be able to get more help for it online from other users. would a higher pressure work better? I only need a cutter to cut paper parts for the original paper toys I make. The parts usually consist of squares, rectangles, circles, and the like. However, every once in a while, I’d like to cut something frilly. I work in 110lb cardstock. So, I’m guessing I don’t need a very fancy machine. I’m rather taken with the Brother Scan n Cut2 and the KNK machines, but either might be much more than I need. Can you recommend something? Hi Mary, the Brother and KNK will do what you want, but are somewhat more pricey. If you don’t mind having to use an internet to operate the machine, I would check out the Cricut Explore and see if it fits your needs. It’s more affordable, simple to use, and will do what you want. If you are cutting only a few basic shapes, a manual machine like the Sizzix Big Shot might be good as well. You will need to purchase the machine and each die that you want, but the machine is easy to use and will cut fabric better. If you are cutting shapes in mass quantities, then depending on the size of the cutouts, a digital machine might be better as it could cut many shapes at once. Hi. I’m in the process of researching die cutting machines. I’m a kindergarten classroom teacher and would like to cut multiple sets (30) of the same design using materials such as adhesive vinyl, card stock, foam, paper, and maybe felt for projects throughout the year (gifts and cards). I don’t have the clearance to go online (it’s blocked) in the classroom and would like to not only use the company’s designs but customize my own design. I would like the ablility to adjust the cutting depth. Piercing and embossing would be nice. I would appreciate suggestions for all three price range. Budget, midrange, higher. I hope I’m not asking for the impossible. I am looking for a digital version instead of a manual (already have that in school). Thank you kindly! I am looking for a scan and cut machine that I can scan in my own drawings/designs and that also will cut marine vinyl (used in boat upholstery) and home dec fabric that is a faux leather. Some intricate cutting would be needed. Which scanner/s would you suggest? Hi Pam, the Brother ScanNCut is a die cut machine with a built in scanner, which might be exactly what you are looking for. I can’t say whether or not it will cut the material you want. I would recommend trying to contact Brother and see if you can get some answers before making a purchase. There are a few different models of the ScanNCut, and the ScanNCut2 was recently released. Hope this helps. I’m researching automated die cutting machines for my own personal use. 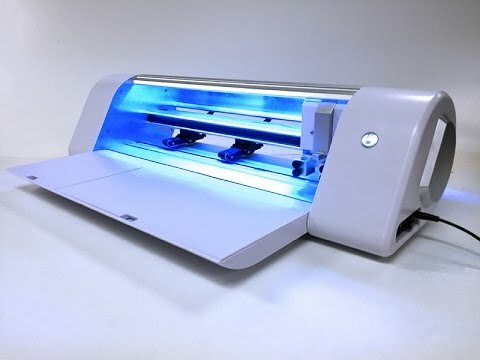 I haven’t ever used one before, but when I read how they can cut vinyl, cut stencils, emboss, engrave, stiple, carve, and write I got really excited about all of the potential crafts with one of these machines! I don’t want to spend too much money, but I want to find the biggest bang for my buck. The two I’ve researched are the KNK Zing Air and Silhouette Curio. The Curio seems to be pretty new, so I can’t find many reviews on performance. I saw one review on the Curio that didn’t seem too happy with its embossing performance. I’d hate to spend that much on a machine that says it can do a variety of things, but isn’t really good at doing any of it (i.e., Jack of all trades, master of none). It doesn’t seem like the Zing Air has dual carriages, but I think it has more cutting pressure. Do the dual carriages really make a big difference? The more I research, the more options I find, the more functionality I realize I need to compare (e.g., cutting width, cutting pressure, ability to customize designs, etc. ), and I’m beginning to become overwhelmed. Do you have any suggestions? Hi Annie, it really depends on what you think you will be using the machine for. Some people just want to cut things and don’t need to emboss. Some people like to cut heavier duty material so they need a stronger machine. The Curio claims to do a lot, but is one of the weaker machines on the market with only 210 grams of force. The KNK Zing has 750 grams, so you can cut a lot more with it. I would say the dual carriage saves time, but it’s not a big deal. I would make one list of features that you are looking for in a machine, and another list of ‘nice to have’ but don’t need features. Then research machines and add them to the appropriate list to help you narrow down which machine is best for you. Wow, I thought I knew what I wanted, but after reading this I’m not sure. I’m mostly going to be creating my own designs with Photoshop and importing them. I was thinking I just wanted to be able to cut paper, but when I think about it I may want to do some cutting of thin fabrics, vinyl, and so on. Seems that I should be leaning toward a Cricut Explore, then. Since I’d probably use each cutter’s own software rarely if ever. Is it really true that the Explore can cut more precisely? Is there a source or comparison for this? I occasionally would want to do something somewhat intricate. I’m an architect that usually works with grey board cartons up to 2mm (and sometimes algo balsa wood), and I’m tired of spending time to cut the pieces on my own, so I’m looking forward to buy myself a die cutting machine. I sually do all my drawings in CAD software (AutoCAD, Vectoworks, Rhino…) and would like them to be imported and cutted. Which one would you recommend me looking at the materials and use I’m gona give to it? This far, the Silhouette Curio is the feature/price die cutting machine that has convinced me. The KNK is a bit over my budget and difficult to buy here in Europe (Silhouette products are really easy to find) and I actually do use a lot more grey board and balsa just a few times, so don’t you think it would be enough? Hi Toni, the Curio will cut up to 2mm thick with the deep cut blade, but I don’t know if it will be good for your material. I think your best bet is to contact Silhouette or try asking your question in some forums like make-the-cut forum or some of the facebook groups. Good luck! I am also a beginner to the world of die cutting. I am a crafter that tries & dabbles in anything & everything interesting. I usually do most of my paper cutting for projects via hand or by using manual cutters. I would like to take my hobby and project making to the next level by purchasing one of the digital machines. I was initially trying to choose between the silhouette and the ScanNCut. But after reading this list, I want a machine that can also etch, emboss, engrave etc. Can you recommend one ideal and one affordable digitial machine for my hobby time please! Oh btw, I will be using this new toy for both paper and cloth, albeit mostly paper as of right now however getting this machine will make the cloth & other material projects so much more feasible and easier!! Also I would prefer not to spend additional money on getting various accessories, like cartridges for different projects. Hi Sonal, all the machines will cut paper and cloth fine. All the machines though will require replacement blades and mats, as they wear out over time. Unless you are doing anything other than cutting, there won’t be any special tools that you need. Certain machines do have software upgrades that cost money, such as the Silhouette, but you don’t necessarily need to upgrade. Hi Sonal, all the machines will cut paper fine for your projects. The Silhouette Curio (http://amzn.to/1TXi5Jg) will do engraving, embossing, and etching, but it is not very powerful, and some users have been disappointed. The KNK Zing has the same features and is over 3 times stronger, but is more expensive. Which machine is better for cutting out tissue paper flower petals — Cricut Explore Air or Silhouette Cameo? I am looking for a cutter for designing pop up cards and books. I work in Adobe Illustrator on a Mac, and would need some way of interfacing with that. I understand Cameo requires a software upgrade for SVG, and Make the Cut doesn’t really run on Mac except for the KNK beta. I’ve been looking at the Cricut Explore, but I’ve heard that the software isn’t particularly well-suited for creating new designs. What would you recommend? Also, are there any cutters that have the ability to “pre crease” areas—like I would do with a bone folder—rather than “score”? Sometimes breaking the surface weakens the paper too much for repeated opening. 1. It is next to impossible to make anything of real worth using the Cricut Explore Design Space. If you do use it, it would only be for making the most basic of images. 2. If you are already using Photoshop or Illustrator, you shouldn’t have an issue since JPEG, PNG, GIF and SVG files are easily uploaded. Depending on the intensity of the project, I prefer to work with multi-layer SVG files. I also have a Mac and have had no issues besides Java constantly breaking. Make sure to CONSTANTLY save. I find that this is an issue more so when I start inserting text into my pieces. 3. As far as scoring is concerned, the scoring tool is comical at best and downright inefficient at the worst. I typically use cardstock and I find that the scoring tool just kinda marks where I need to make my fold at. If I need a clean fold, I will need to go back over the “score” line with an X-Acto knife (depending on the thickness of the cardstock I’m using). This is late, but I hope it helps. Hi! I’m wondering if you settled on a cutter that suits your needs. I’m a designer and Mac user, adept at Illustrator and the Adobe environment, so I’m starting out with the same issue that you had. Thanks! Hi, I am considering either the Silhouette Cameo or Portrait. I make cards to sell on my Etsy Store. I have a lot of stamps but most don’t come with dies and I don’t like fussy cutting. I want to be able to scan, upload and cut my stamp image. I then color the images using Copic Pens. Then put my card together. I am thinking if I get all my stamps imaged I wouldn’t need to keep the actual stamps anymore. Is the Cameo or Portrait better for my needs? Thanks for your help!! In new to die cutters, but ive been advised to look into them. I make fely decorations and currently cut everything by hand which is very time consuming. Id like to be able to cut my own designs from felt, but i dont want to spend more than i really need to. What would your suggestions be please? What about the Pazzles Vue? Hi Heidi, thanks for the suggestion. We have added the Pazzles Vue to our list! Can you tell me which of the digital cutters cut fabric? I have read your post about the manual cutters but I’m a quilter researching die cutting for applique designs. Can you shed some light on up-to-date information? Does the new Cricut work with fabric? Any new advantages with the Brother ScanNCut2? Using the company software, can I take a PDF and the software’s image-tracing features to create designs for fabric cutting? I have just started researching cutting machines for myself, but mostly for paper cutting. I ran across this website that might help you. Hello..i would like to buy a die cut machine that doesn’t need any catridges,speed at cutting,one that works without internet. Please suggest me the suitable one. Hi Platinum. 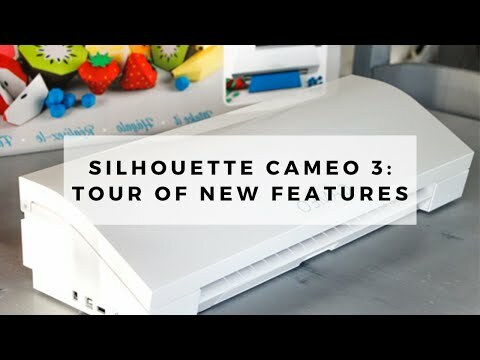 The Silhouette Cameo might be a good machine for you. It’s not the fastest machine but it doesn’t use cartridges and it works without the internet. Hi! I wanted to know what’s better. The curio or the circuit explore air? What are the main differences. cons/pros? Really undecided.If anyone has any advice please help. I am looking for a machine mainly for vinyl and some card stock. I am a beginner but have experience with adobe illustrator. Any suggestions as to what machine would be best? I am interested in cutting fabrics and felt, possibly layers of fabric for quilting/applique, etc. so I am concerned about the proper cutting force. I am not much into paper crafting, mainly sewing/crafting. Also need one capable of downloading and creating my own templates for cutting and vinyl heat transfers. Any other features along these lines I may not yet be aware of would be nice as I am a newby trying to make my designs easier to create and yield a more professional and finished look. Hi, I am in currently in Nigeria. I am new to all this. Was exicted with all Cricut explore air 2 can do and made an order already. But the bad mews is that I just contacted them and the software cant work in my country. Am badly torn and confused. Please what die cut machine can work as good as the Cricut and still work in any region. Really really urgent now!.Cos i have to ask my friend to cancel or return the Cricut, Unless there is a way to work around it. Maybe consider using a vpn? I am new to this but I am interested in making tackle twill patches for sweatshirts and such. Im not sure which machine would be a good fit. I’m looking for a machine that makes 1/4″ DEEP cuts into lauan plywood or masonite. Is there such a machine, or is there a way on one of these machines to make multiple cuts into the same material? The strongest die cut machine in the hobby world is the KNK Force, which might cut it with some experimentation. 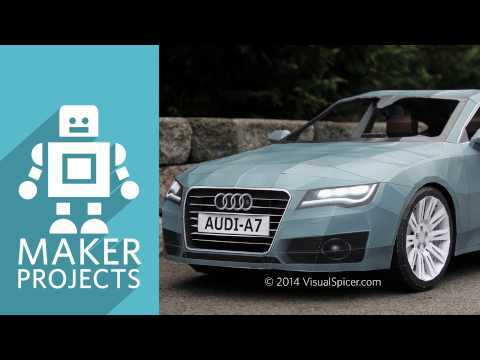 It seems like a CNC machine would be better suited for this type of project. I have started to consider purchasing a die cutting machine. I am interested in adding text to my daughters cheer bows, so mostly ribbon. Also there seems to be a lot of choices to add colors and texts with these machines. Is this something that would help in making a unique variety of cheer bows or is there something else I should be looking for? Hello! I have the need to cut some semi-simple “silhouette” shapes out of watercolor paper, many times over per each design, without any other fuss. I do not need any other bells or whistles, just the easiest, fasted, sturdiest meat and potatoes machine that will run for awhile and allow me to not have to spend hours setting up or peeling paper off of hyper sticky pads. Any advice? Is there a digital cutter that you can use with adobe illustrator to do cutting, embossing, engraving and such on multiple materials so you can do custom designs? Can anyone recommend which machine would be best to cut mylar? I am uncertain about which machine to purchase. I need a machine to cut out appliqués for quilting and small intricate designs for scrapbooking. I have difficulty using scissors. HI, I am looking to buy a die cut machine. I am a graphic designer and want to be able to create my own designs to be cut, therefore I need one that accepts either svg or eps files. I don’t want to have to buy cartridges to make it work. I plan initially to use this to make my upcoming wedding invitations and any other print related items for the wedding. In the future I would like it to cut vinyl or laminate for screen printing purposes. Also do any of them do embossing or sketch/lettering. If someone could please let me know their thoughts on which would be best I would really appreciate it. I’ve enjoyed my Brother Scan ‘n Cut for about 3 years and have never connected it to a computer or internet. I’ve created designs on my computer to print, scan, and cut (or you can put the file on a thumb drive to download to the machine). You can also upload scanned images, using the machine’s scanner without cutting. The only problem I’ve encountered is if the image to scan isn’t absolutely crisp, your cutouts won’t be either. And be sure your paper is secure so it won’t shift during cutting. Several features of this machine require some learning and experimenting but it’s worth the trouble. I’m planning a wedding where I will be DIYing the majority of items: decor, invitations, Tablecloths, signs, etc. I’m looking for a machine to make invitations (intricate cut wrap, embossed printing, gold foil accents), vinyl wording for glass signs, & menu cards. I don’t need to cut or emboss anything thicker than standard cardstock and thin vinyl, but do need flexibility in design. Which machine would be best for this? Is there any cutting machine that doesn’t require a computer? I’m not wanting to use dies like with the Sizzix Big shot either. Hi Ginger, there are machines that don’t require a computer, but they are a little outdated. One such machine is the Cricut Expression 2. I need to be able to download school logos and print them. Is there a machine and/or software that is better to do this? I’m completely new to die cutting machines but can learn anything quickly! Hi Tah, many machines have a ‘Print then Cut’ option. 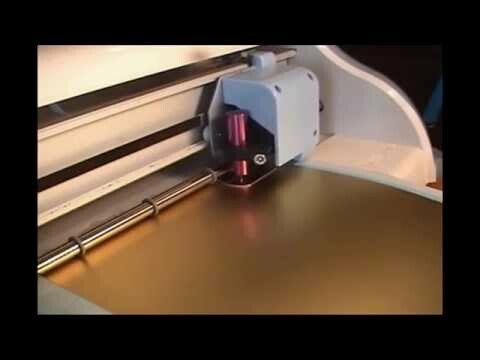 This option allows you to print designs on your home printer and then have it be cut by the cutting machine. Die cut machines don’t actually do any printing, so you’ll have to use a printer or get them made by a print shop before you start cutting them. It might be better to just get what you need done from a print shop instead of spending the money on a machine, buying the material, and learning how to use it. 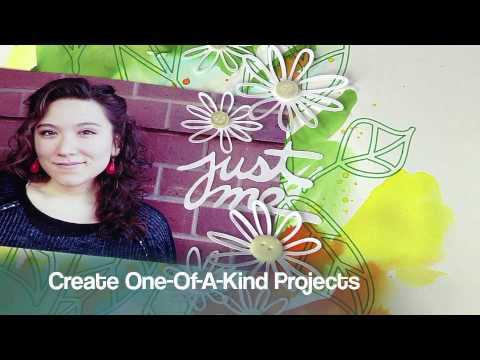 I would like to be able to create custom designs using the Adobe Creative Suite on my Mac, and I’d like to have the capability of cutting lots of different materials. What would you recommend? I need a die cutting machine that will cut up to 5 mm of leather. I was looking at the KNK Force but it doesn’t appear that is being continued by that company(?). Any recommendations for other machines with similar force? Hi Carol, the Cricut Maker also has 4000 grams of force and is really nice. It has a rotary blade and knife blade for cutting fabric. You might want to check this page to see what kind of leather it can cut. Cricut Maker is on Amazon and Cricut.com. Hi! I work at a company that does a lot of packaging comps, and we need something reliable that can ideally cut and score pre-printed boxes, etc. Maybe something that can detect a dieline and cut. Price isn’t really a factor, we’d like to find something as large as possible. Is there a machine you would recommend? Thank you! Hi Stephanie, I imagine you’re going to be working with a lot of big boxes? In that case, I don’t think any of the machines listed on this website will be adequate for your needs. Hello ! thanks for ur effort and saving my time looking for cutting machines alternatives ! all she needs is something reliable and VERY simple to cut a customized small paper box Through their app or what ever. cutting different materials isnt a must .. but a bonus … as long as she is thinking of using papers only for now. what machine do u recommend for less maintenance and what size do u recommend i should go for .. ? I am liking for a machine to cut out from bristolboard, the plans for Christmas glitter or putz houses. The plans are available online and are sharp and clear. I also need to cut from my own design the window and door frames for the same houses. That is all I need the machine to do . Any suggestions? Will either the Cricut Explore Air 2 or the Cricut Maker cut vinyl and mat board? I need 1 machine that can do both. Please advise.